Trendy jacket made of natural wool and faux leather. 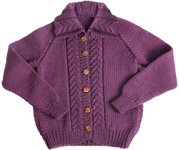 We offer this coat in colours suitable for boys and girls. This jacket is hand made in Great Britain.